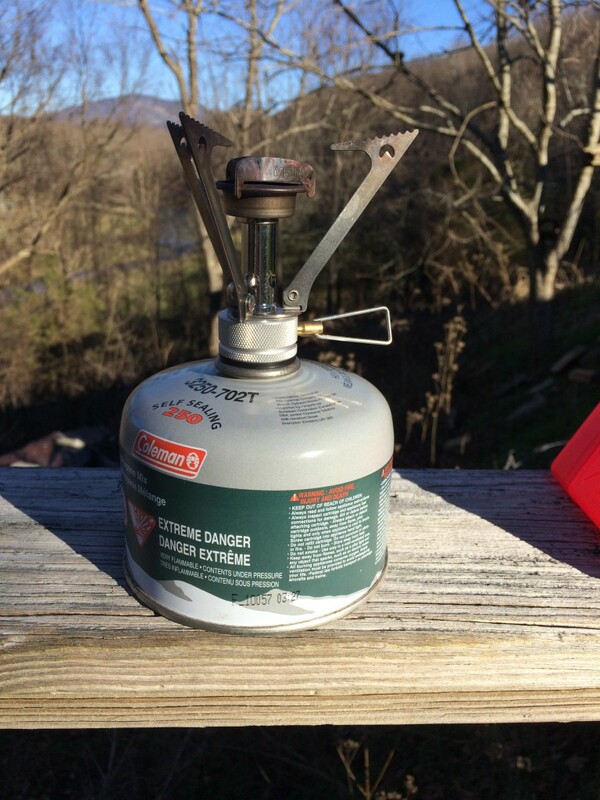 In my books, my lead character carried a canister stove in his pack. It’s a stove he’s familiar with through backpacking. 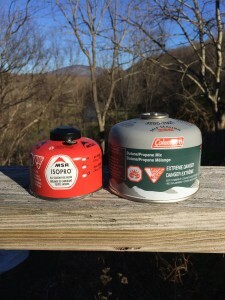 The reason I selected that particular stove is that I am familiar with it through backpacking, too, and it has served me well over the years. That stove is the MSR Pocket Rocket. 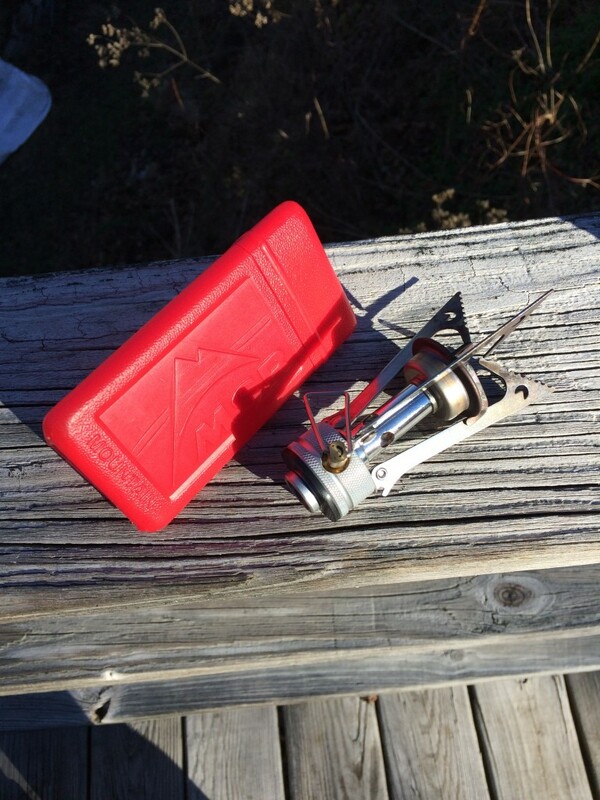 It’s a hugely popular backpacking stove that uses readily-available canisters of a propane/butane mix. The stove runs $39.95 on Amazon, which is exactly what it cost when I bought mine around 8 years ago. 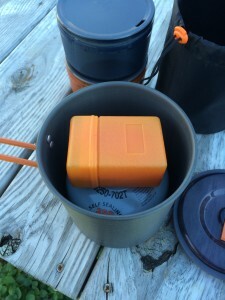 The stove weighs around 3 ounces and comes in a plastic case. It doesn’t have an igniter so you have to use a lighter or some spark source to light it. It boils a liter of water in around 3 1/2 minutes. Three arms fold in to make the stove compact for storage, then fold out to rest a pot on. I’ve never dumped my dinner yet, but I’ve seen it done so you want to make sure that you have a stable cooking base before you start. If the wind gives you trouble, making the stove lose heat, you can make a screen out of aluminum foil to shield the flame. One complaint about the stoves is that they do not function as well in extended sub-freezing conditions. Notice I say “extended” — I have used mine many times on camping trips with overnight temps in the teens or for making coffee on a snowy hike. It does work in cold temps, but extended trips in below freezing temps may cause you some issues so be aware of that. Use of the MSR brand of fuel rather than other brands such as Coleman or Primus is supposed to alleviate this problem somewhat, as MSR has developed a mix that reportedly performs better in those temps. 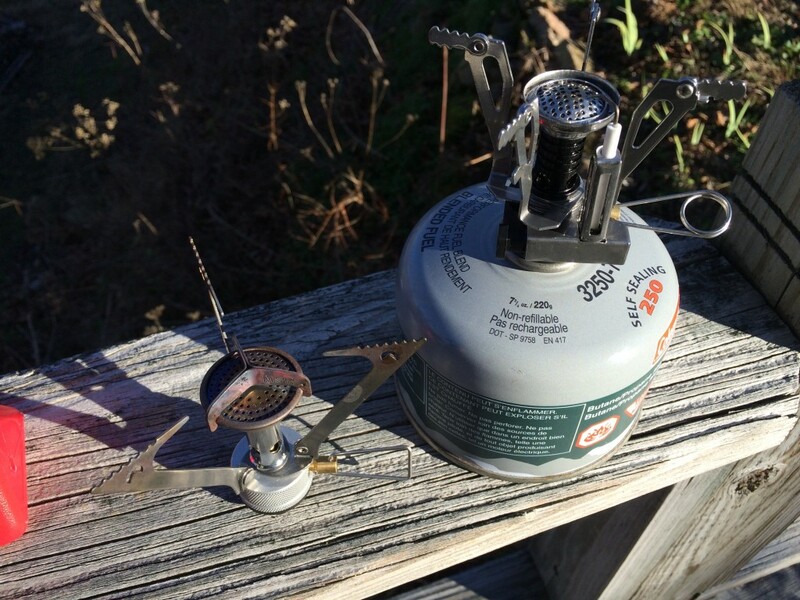 If you’re likely to be facing those extreme, arctic-type conditions, though, you may want to look at a liquid fuel stove instead of a canister stove. What if you don’t want to tie up $40 on a stove that’s going to sit in your BOB and not be used all that often? 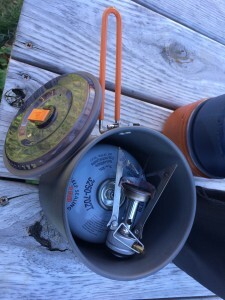 One option is a Chinese knock-off canister stove, also available on Amazon. I’ll include links to both stoves at the end of this article. My son got me this stove a couple of years ago as a backup. It cost less than $10. There are several on Amazon and they’re all in that $15 and under range. It’s made a little differently, but it includes a piezo igniter which works really well and it’s in the same weight range of around 3 oz. For the price, it works like a charm. 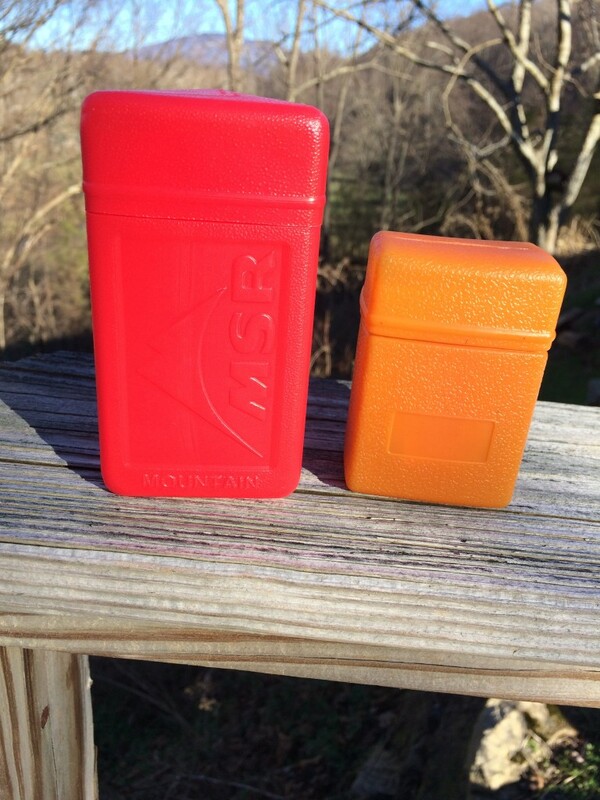 I’ve included some pics to show the size relative to the MSR, which comes in a red case. You can pick up cans of fuel everywhere from camping stores to Walmart to Dicks Sporting Goods. Price vary but generally around $5-6 or less. MRS also has smaller cans available. 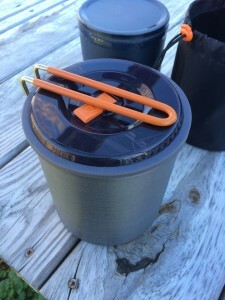 The thing I like about those is that I can fit a can of fuel AND a stove inside my cooking pot. The cooking pot came with a selection of smaller pots, cups, and bowls but in a BOB I leave those out for weight savings and just use the big pot. The particular pot that’s shows is from a GSI Halulite Dualist cook set. 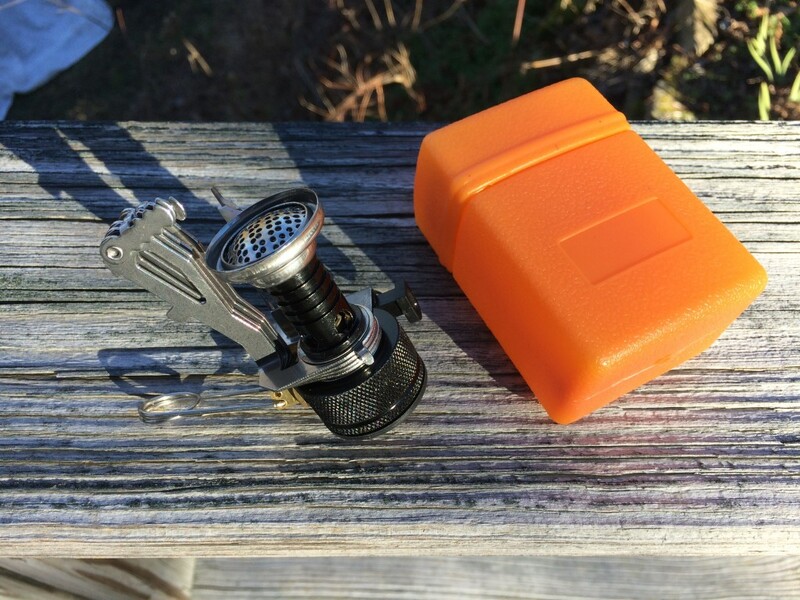 I’ll also include a link to that if you’re interested in checking it out, although an aluminum Coleman backpacking set will serve the purpose for cheaper. If you have any questions, drop me an email. I don’t claim to be an expert but I do have some experience that I’m willing to share. Bug Out and Get Home Bags have to be individualized to your own needs, based on where you’re likely to be going, how many days you’ll be on the road, and the conditions you expect to encounter. The important thing is that if you don’t have one, you start building one.